Material cutting Archivy – ITB Engineering & Production s.r.o. We have a powerful Bomar gravity belt saw, where the in feed is carried out by the own weight of a massive arm, with the option of a continuous control by throttle valve of the oil damper. We offer a large cutting range of angular cuts from -45 ° to + 60 °. Precise hard metal saw belt guide, the saw head joint mounted in pre-stressed tapered roller bearings, the 27mm high saw blade and the synchronously running brush for sawdust removal guarantee excellent cut. 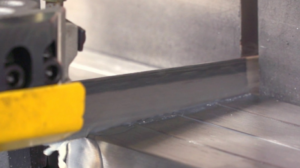 The saw is equipped with a 7-m long roller feeder that allows seamless cutting of even larger semi-products.